Patrick S and Jon N will be reporting live this week from the 76th Annual International Premium Cigar and Pipe Retailers Association (IPCPR) Trade Show in Las Vegas. Check back regularly for updates throughout the day. Patrick S (10:15 PDT): This year the show returns to Vegas after being in Houston last year. Despite a recent smoking ban, this is still a great cigar town. There are plenty of places to buy cigars and lots of places to smoke them. I’ve already smoked cigars at the bar, the craps table, the roulette table, the sports book…you get the idea. I’ll be heading to Casa Fuente later today. The show doesn’t get into full effect until tomorrow when the convention floor opens (when I expect the updates here to be more fast and furious), but tonight it opens with a cocktail reception. Patrick S (1:23 PDT): We did hear from General Cigar on Friday about their new cigars. I’m looking forward to the La Gloria Cubana Artesanos de Miami rolled in Miami, and also new blends in their Cohiba Line (a Dominican puro), the Macanudo Line (celebrating 40 years since General first started creating Macanudo), and the Hoyo De Monterey Excalibur Legend. General VP Victoria McKee will be personally introducing me to the new lines tomorrow, and we’ll be sure to give you our first impressions. Jon N (6:20 PDT): Patrick S and I have arrived in Las Vegas, and we got to check out the trade show floor as it was being set up. 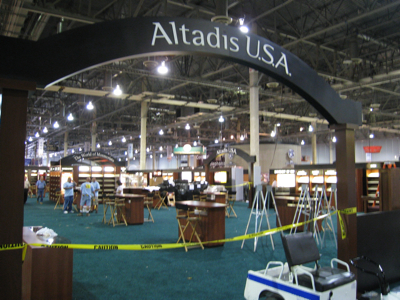 The big names (Altadis, General, etc.) are in full force with large booths and plenty of floorspace. Like Vegas itself, the show floor is enormous—larger than life and probably pretty easy to get lost in. We look forward to doing so tomorrow morning. The following photos don’t show just how large the floor is. Patrick S (6:40 PDT): No cigar smoker’s trip to Vegas would be complete without a stop at Casa Fuente. Not surprisingly, the place was packed, but we were fortuate enough to smoke some sticks with a great group of stogie smokers, including Jerry from Stogie Review and Bob from DogWatch Social Club. I enjoyed the Casa Fuente I had (which reportedly features the Opus X blend with a Cameroon wrapper), but I actually enjoyed the King B I bought there even more. Later this evening we’ll be heading back to the IPCPR show for the opening reception. 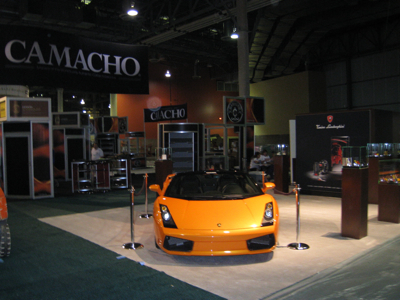 For the record, I plan to win the Lamborghini pictured near the Camacho booth. As I told Patrick, perhaps drunkenly, "I drove here in a Prius and I'm driving home in that car." Only time will tell if my vision was eerily prophetic or the ramblings of a drunken lunatic. Keep up the great work guys! I love your reporting format, and I can't wait to read/see what you have to show me once the event gets into full swing tomorrow. I heard that Avalon was out of business, but I also saw them listed on the IPCPR vendors list. Have you guys seen them yet? I have a 2ft.x3ft. colored poster in a red frame. a lot of different colored cigar bands. is there someone interested to buy it? ?